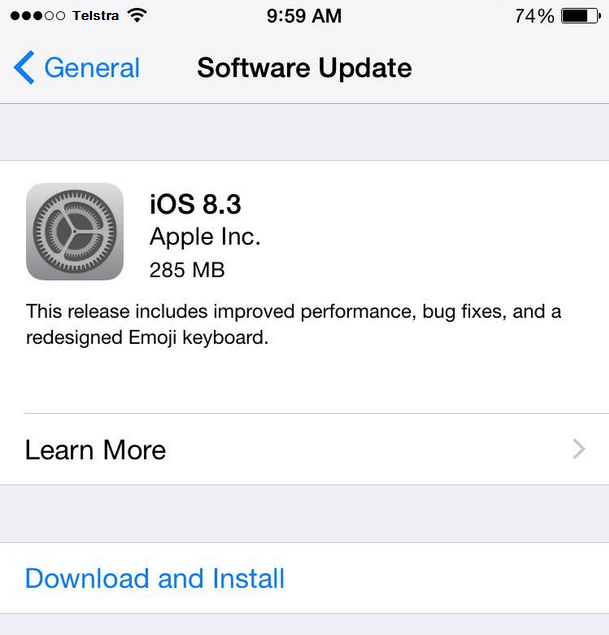 Apple has released iOS 8.3 for iPhone, iPad, and iPod touch. The software update includes 300 new Emoji icons, a variety of small new features, some minor user interface changes to keyboards, a variety of new languages for Siri, and a handful of performance fixes and optimizations, including resolutions to various wi-fi issues and Bluetooth connectivity. Full release notes for iOS 8.3 are listed below. The iOS 8.3 final weighs in between 250MB and 1.5GB, depending on the device being installed on and the currently running version of iOS. You will find that iOS typically requires at least 2x that space to complete the installation, and if there is not sufficient space available you will be told to free up storage capacity on the iPhone or iPad. The easiest way for most users to download and install iOS 8.3 on their iPhone or iPad is through the Software Update mechanism on the device itself. Be sure to back up your device before attempting to install the software update, either through iCloud or iTunes, if not both. The update will install itself automatically beyond this. Another option is to connect the iOS device to iTunes and let that app complete the update for you. Updating through iTunes using a computer is also a way to update to iOS 8.3 if the iPhone or iPad does not have enough free storage space available to install through OTA. Just be sure to backup with iTunes before beginning that. Have any other issues installing the update? Find solutions to them? Share in the comments.